Bill Freivogel, Greg Magarian and Mark Smith joined St. Louis on the Air's Legal Roundtable today. On Monday’s St. Louis on the Air, our monthly Legal Roundtable reconvened to discuss pressing issues of the law. This month, we focused on St. Louis Circuit Judge Timothy Wilson’s decision to find Jason Stockley, who is white, not guilty of murder in the 2011 death of Anthony Lamar Smith, a black man. We also discussed the ensuing protest and issues of the First Amendment, the upcoming session of the Supreme Court of the United States (starting Oct. 2), among other topics. 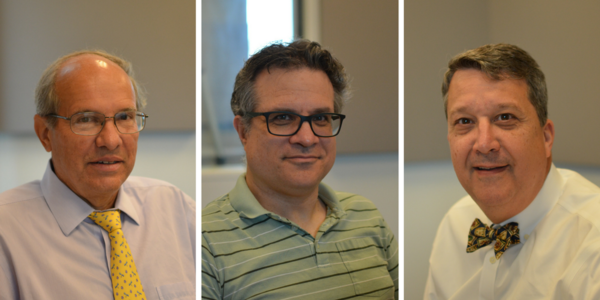 Our monthly Legal Roundtable panel of experts discuss the Stockley verdict, protests, and the upcoming Supreme Court Session with St. Louis on the Air host Don Marsh.